You can drink it year-round, but what’s a better cool adult beverage to bring to any outdoor BBQ (or in my case, another bridal shower)? My recipe has been a favorite among many and been passed along too many times to count. Any dry red “roja” wine can be used. I personally used a Malbec from Chile this past weekend. I also doubled this recipe to fill a large punch bowl. Cheers! Wash all fruit thoroughly. Using the raspberries and a half quart of strawberries, mash the fruit to a puree using a hand potato masher. Cut the remaining strawberries, and section the apples, oranges, and limes. 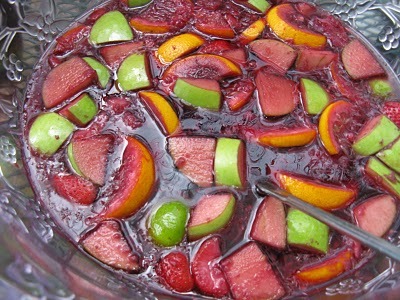 Also squeeze and juice some of the oranges and limes to add additional fruit juices to the sangria. Add the wine, brandy, sugar and Sprite. Stir and taste. I prefer to add Sprite for desired sweetness over sugar. This is truly a taste testing game. It may also help to refrigerate and chill before tasting again.